Last week, the House Transportation Committee unveiled its proposed six year transportation bill calling for 33% cut over current spending levels. Needless to say, the bill does NOT prioritize bicycling, walking or transit. It eliminates Transportation Enhancements and Safe Routes to School. It would give states the “flexibility” to spend money on biking and walking if it chose to, but such funding would be at the mercy of the state highway departments. It also cuts federal contributions to all transit system by 34%. How will this impact our region, which has over 133,000 bike trips and 1 million transit trips taken on a daily basis and where 19% of fatal traffic crashes are pedestrians and bicyclists? The Philadelphia and Camden metro region would lose over $100 million in federal funding annually, causing the loss of over 4500 jobs. If TE and SRTS programs were eliminated, it would amount to an annual loss of $10.1 million in bike/ped funding and consequent 100 jobs. NJT, PATCO and SEPTA would lose $118 million (37% of their federal formula funding), 4446 jobs and more cuts to transit service. 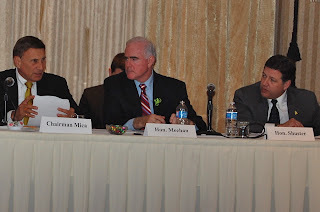 When we visited Congressmen Meehan, Gerlach and Fitzpatrick this past winter, they indicated their support for bike/ped funding in our meetings. Now we need to ask them and the rest of the Congressional delegation to step up and defend these programs and current funding levels. Ask your Member of Congress to not support Chairman Mica's proposed bill. Send a letter to your Congressman and Senators that you want bike/ped funding to stay in the transportation bill and that transit funding should not be slashed. Here's what some others are saying about the Congressman Mica's bill. The U.S. Chamber of Commerce said the plan unveiled by the was "unacceptable," and said it would "destroy -- rather than support -- existing jobs." The American Association of State Highway and Transportation Officials said that they "continue to have concerns about the proposed funding levels included in the bill." Richard Trumka, president of the AFL-CIO declared that “it is astonishing and unconscionable that the House Republican leadership would push a surface transportation re-authorization bill that would gut current infrastructure investment by a third and obliterate over half a million jobs in the next year alone." Transportation for America said that it was "skeptical that investments at this level can meet the country’s infrastructure needs." Andy Clarke of the League of American Bicyclists said "Mica's 'New Direction' proposal in fact turns the clock back on decades of hard-fought progress towards a truly multi-modal transportation system that offers American's real choices. Even with a 'small' bill, returning to a 1950's highways-only mentality flies in the face of fiscal responsibility by guaranteeing more single occupant vehicle travel on ever more congested and dangerous highways that we can't even afford to maintain, let alone build."